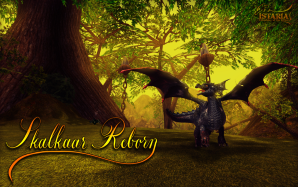 - Skalkaar, the Dragon Tutorial, has been reborn. - An overhaul of the Dragon tutorial island of Skalkaar has been completed. This includes a beautification of the island to be more visually appealing, a revamp of the quests and NPC dialog, new NPCs (Creena, Malimer, Droegan, Raghael, Viseria, Daeneyr), new idle actions, and improved appearances (Drouk and Karkath). Thanks for Pastle and others for this overhaul. - The Sslanis Militia is looking for assistance with a growing threat to the jungle and island! The Bloodletters, a fierce clan of Fyakki, have overrun the Island of the Drowned and are threatening the western coast of Lesser Aradoth. - The Clerical Order has opened its ranks to Gifted players who are interested in climbing the ranks of the Order. Visit Abbin the Registrar at the Tower of Healing. Clerical Tokens are earned for completing quests from members of the Order around the Tower. Adjustments to abilities for five schools (Warrior, Mage, Cleric, Scout and Dragon Adventurer) have been completed for levels 10 to 20. *Enhanced Flame Bolt 2 is now known as Fireball 2, does 10% more damage while in red stance, and can burn a target increasing the damage of Tier 1 flame spells. - Shield Stance now counts as Stance "E"
- Modified the Spell: Fortify technique to add a flat 20 armor per tier instead of the 10% of base armor. This change allows all races to benefit from Fortify, and increases the benefit. - Obsolete spells xGenerate Health I-VI now share recycle timers at 100% against all versions of the spell. - Fixed Talisman of Revelry and Scale of Revelry to have the same keyword damage type conversion as Stone of Revelry. - Replica Chest Scale of the Prime and Replica Tempered Chest Scale requirements have been lowered from level 30 to 25. - Cursed Health Potion will properly consume itself upon use. - Ambrosia Revamp: Epic ambrosia is now available! The epic ambrosia will remove up to 10 deathpoints, and is crafted using Empyrean Essence that is harvested from Greater Epics using an essence siphon or essence harvesting ability. Vargas sells the formula, he does charge a lot for it. - There are now 3 new Wooden Training Posts (Wooden Training Post (elemental), Wooden Training Post (animal) and Wooden Training Post (Undead). These new posts will simulate attacking an animal, elemental or undead target. This will let you test techs/augmentations that only apply to a certain type. - Prime Bolt and Improved Prime Bolt have an arcing flight path. - New Defense tech kits of Evasion, Magic Evasion and Dodge can be found on the loot tables. - All Trinket Baubles can be manually right clicked, removed by players. - Dispirit's delay adjustment now properly only affects melee abilities and attacks. - Gift spells now have the "buff" keyword, which will allow Fortify and Cleanse to be applied to them. - Epic resources (Annisil Cord, Dense Leather Band, Ithilium Bar, Taravist Crystal, and Velanthis Wood Strip) now all have their own unique icons rather than borrowing from other resources. - Resized and adjusted the quantity of Risen Skeletons that spawn outside the Kion South Gate. There are now more than before, but closer to the gate only spawn 1 at a time. - Adjusted the spawn rate and quantity of Shadow Tarantulas and Bloodflies within the WEstern Deadlands including splitting the linked Tarantula spawn into two. - Frozen Horrors now have their own school, are no longer immune to regular damage types, and no longer drop Fiery Rift loot. - (Daily) quests has been verified for consistency. All quests that give experience or coin rewards will now award the full amounts on every quest. - The Withered Bane now once more requires the player to loot the Blighted Bone after killing the Grand Magus, to fit better with the dialogue present in the quest. - Fixed quest "Loyalty Title - The Mature" because it says today is "your 100th day", but it could be anything greater than 100. Now says, "your 100 days of service to the empire"
- Added daily quests to Dekhail the Scout: "Carapace Hunt", "Sapphire Hide Hunt" and "Flaming Tongue Hunt"
- The knock-off "Presnet" mimic pets now look different to their original counterparts from the Hours of Frost event, now boasting ripped wrapping paper, torn ribbons, and overall dirtiness. - Updated Skull Head Scale Tech Kit to consume itself upon applying. - Updated Harlequin Shirt to be able to make Tech Kits properly. - Gnomekindle wear can now be used to create tech kits of their respective appearance, including the treant shoulder pets! Other shoulder pets to follow soon. - Almighty Cauldron now has a stat cap trigger to never allow it to reach above 39999 health and never gain more than 0 speed. - Ryson no longer refers to the time since the detonation of the artifact and his death in specific years, but merely says "more than twenty years"
- Players on Free Access sometimes can't open crates and get the rewards. - Elm Treant leaves no longer get stuck midair and stretch during animations such as death.